Winning the Young Persons Blog Award at the UKBA in April was an amazing experience – I met some lovely bloggers and gained confidence with my blog. After leaving University I was worried that my blog would either turn into a series of depressed posts about unemployment or finish altogether. I’m really glad that I didn’t give up and turned my experience into posts which will hopefully help/support other graduates. 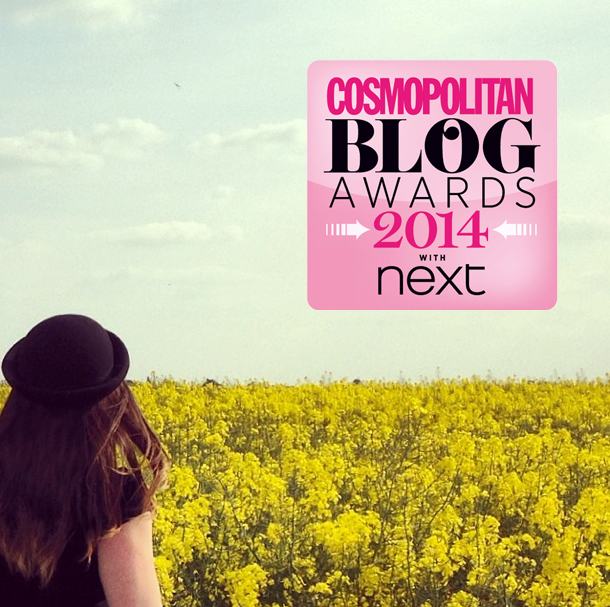 I wasn’t sure about asking you guys to consider nominating me at first, but being shortlisted for the Cosmo Blog Awards is very exciting – thank you if you did nominate me. It’s a bit of a weird one as the Cosmo awards are heavily focused on beauty and fashion, which we know Graphique Fantastique is not. I’m glad there are a couple of ‘unusual’ category choices though, as it reflects the ambitions of today’s females: Best Travel Blog, Best Interiors Blog, Best Careers Blog, Best (use of?) Social Media Blog. It’s not all about mascara and shoes (although we all like them too)! I wouldn’t describe myself as a feminist, but I wrote my dissertation on ‘Women in Graphic Design‘ to research and prepare myself for the industry I was about to graduate into. It has been a male dominated industry in the past but it’s now beginning to change and as a young female creative I’d like to think I’m part of that. I’ve been working hard on the BA (Hon)est series to plan and write posts which I think will help creative graduates. I was in the same situation last year and had quite a tough time making the transition from student to graduate – it’s emotionally draining! Nowadays if we have a question we tend to google it (come on, we all do it!) but there are just some things that you can’t find on google and can only learn from personal experience. The creative industry is a small world with its own ways and methods. I obviously don’t know everything about it (yet, I’m learning!) I have been lucky to be around and speak to a lot of wise people. I’ve been a sponge, soaking up all of the knowledge and I wanted to share the quirks and charms with you guys. Graphique Fantastique is a blog about my journey from student to graduate to designer so I think it’s quite fitting that I’m nominated in the Best Career Blog category. 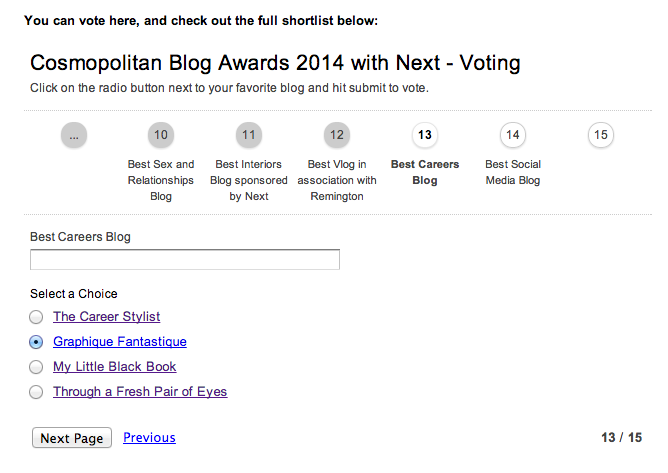 If you enjoy reading my blog/ looking at the photos please consider voting for me – click here. It will take you a lot of clicks to get there, sorry, but make sure you click next page through all of the categories until you get to page 15 and fill in your name and email address at the end or the vote won’t count! You can find me in Category 13 as Graphique Fantastique. You guys came through for me last time and I know you will be total stars and help me out again!